"The Bible is most of all a Story. It's an adventure story about a young Hero who comes from a far country to win back His lost treasure. It's a love story about a brave Prince who leaves His palace, His throne-everything-to rescue the one He loves. It's like the most wonderful of fairy tales that has come true in real life! 1. Sally Lloyd-Jones, The Jesus Storybook Bible, p. 17. I grew up believing in Santa Claus. I vividly remember getting up early Christmas morning, much to my Dad's chagrin, and running out to the living room to find presents under the tree and Candy Canes hung all over the Christmas tree (this was something "Santa" did every year at my home). I also remember the day that I found out Santa Claus didn't exist. I believe I was around 7 years old and I was in my Grandmother's kitchen. I started asking my Mom questions about the Easter Bunny [who I always believed was creepy!] and she allowed my questions to lead me to the logical conclusion that the Easter Bunny didn't exist. I quickly drew the conclusion that Santa must not be real either. My Mom confirmed that my reasoning had led to a sound conclusion. Now I have my own children and my wife and I had to decide what to teach them about Santa Claus. We decided not to teach them that Santa Claus is real. No flying reindeer with glowing red noses. No strange man coming into your house at night, eating all the sweets and then leaving through the chimney, unless you don't have one, in which case I was told by one child that Santa simply turns into magic dust and goes through the keyhole! 1. I have no good reasons to believe that a man exists who flies around in his sleigh guided by magical reindeer delivering presents to boys and girls all around the world. 2. It would be a lie. I also want my children to know that everything my wife and I say to them is true to the best of our knowledge. 3. Santa is strangely "god-like" in many of the popular stories and myths that circulate about him. For example, claiming that "He sees you when your sleeping; he knows when you awake" seems to make him omni-present, an attribute which can only be properly used to describe God. 1. 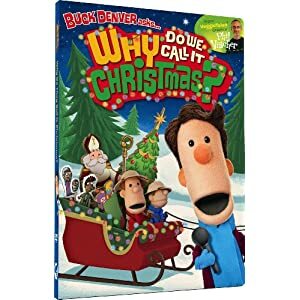 DVD- Buck Denver asks...Why Do We Call It Christmas?- This video discusses various Christmas traditions such as the origin of the name "Christmas," why we put trees up and who was St. Nicholas? 2. Veggietales DVD- St. Nicholas: A Story of Christmas Giving- The story of St. Nick told Bob and Larry style! Are there any resources that you would recommend? Do you have any thoughts on Santa that you would like to share? Wintery Knight has also blogged on Santa here. 1. It should be noted that I did not grow up in a Christian household. I have a relative who used to be agnostic. He has since become a theist. He used to jokingly say things like, "Merry X-mas" to me in an attempt to get under my skin. I also recall a very godly woman I knew, who has since gone on to be with the Lord, telling me that she would never say, "Merry X-mas" because it was an attempt to take Christ out of Christmas. However, is that the case? "In Greek, the original language of the New Testament, the word for “Christ” is Χριστός, which begins with the Greek letter that is essentially the same letter as the English letter X. So, originally, Xmas was simply an abbreviation of Christmas. No grand conspiracy to take Christ out of Christmas. Just an abbreviation." So, the next time someone tries to be clever and wish you a "Merry X-mas" in an attempt to "X" out Christ, share with them the real meaning of "X-mas" and the life changing message of the gospel. Video: If God, Why Evil? God is Love. Through acceptance and abiding in this Love we learn to love aright in a fallen world. From it we worship in spirit and in truth. It is the foundation upon which we function as a disciple of Christ. We grow in knowledge from the overwhelming awe this love invokes within our hearts and mind. God, being Pure Love, gives sinful creatures the ability to love Him. It is truly breathtaking when one takes the time to meditate, pray, and study out God as love. But not many Christians embark on such a spiritual journey. Why? Because one word will ultimately surface when studying God as love because it cannot be avoided: Trinity. The oddity, the complexity, the mystery of the Trinity is alluring to many who believe in the God of Bible, but those same things which attract can cause one to regard it as a part of faith best left unknown. Yet if there is one area of truth which the church needs today in this world of relativity, it is the Trinity; known and understood to the best of our ability this side of Paradise. Not just for our own faith, but to share with all who will hear that our God is the only God who loves, and thus because of the Trinity. As someone who spent a few years curiously picking up random literature with a focus on the Trinity, and putting them down because of their complexity, I was delighted to have Michael Reeves book arrived in our mailbox. As soon as my husband opened the package and showed his excitement over the content, the book was snatched from his hand to mine and the pages were turning. It came at just the right time, as I had felt a pressing need to delve into the truth of the Trinity for months, but I wasn't sure with which book to begin. And here it was, delivered to our house. It was just what this disciple of Christ needed to begin her journey with the Trinity, and Love. With witty writing, strong evidence from the writings of early church fathers and historians, as well as clear and precise explanations to accompany historical writings, Reeves has written a book that is easy to read, yet makes the reader stop periodically to ponder the content. I would describe it as Trinity 101. I hope the following details of the book will encourage you to read it for yourself and use it as a springboard to study the being and nature of God. [p. 18] If read with the full intent to know God more, the answer to his prayer will find its fullness in you. Throughout the book, Reeves adopts a writing style of repeating and building, repeating and building. For some this may seem a weary read, but I argue that it is necessary. What is continually repeated is that the Father loves the Son, and that love is through the Spirit. This is repeated in every chapter and built upon so that one understands: if the Father were God alone, there would be no love because it would be a selfish love; the Son has always existed with the Father so that there is One who loves and One who is loved; there cannot be love with a mutual Spirit of love. Love is found pure in the Trinity; and because the love the Father has for the Son was so beautiful and pure, it was shared through creation and given to the creatures made in His image. In that love we have the beauty of creation. We have the beauty of salvation. We have the beauty of a Christian life empowered by the Spirit, given by the Father and Son, because of love. Brilliantly, Reeves takes the reader into the final chapter (and the 5th one at that!) to challenge atheistic arguments such as those found in Christopher Hitchen’s book God is Not Great (that God is a Ruler, a Big Brother, a Stalin-in-the-sky) as well as the New Age and neo-paganism dislike and foundation that God is greedy, selfish, and a huge bore. Reeves also addresses evil and God’s wrath in this chapter. We quickly come to understand that the Trinity answers these counterfeit claims of God’s being extremely well and Reeves allows the reader to build strong support for such claims. This is accomplished through the repeating and building of the book from the introduction to the conclusion. The last paragraph of the last chapter thus begins, “And so we come to where we started: Jesus as the bright lane to knowledge of the true God. As the Glorious Spirit-anointed Son, he reveals the Father. He reveals God to be Father, Son and Spirit – and thus he reveals the only God who is love, and he shows us the true glory of that love on the cross. In him we see a God far beyond the bores and tyrants we all rush to reject. In him we see the good God. And how good he is" [p. 128]! A strong and full introduction, five chapters written with wit and wisdom, and a challenging conclusion to the one who names himself a disciple of Christ comprises this book. It allowed this reader to finally begin to truly grasp that God is love. We live with dim reflections here in this fallen world, but we do have a choice as to how dim that reflection is by how much we delight and desire to know God. This book will allow the dimness to decrease a few more degrees; it will allow the reader to see more fully the God who allowed him to see in the first place. This book review was written by Danielle Gross. She holds a Master's Degree in Elementary Education and is a homemaker. She also home schools our two girls. You can find our other "Counterpoints" posts here. 1. Francis Crick, What a Mad Pursuit, (1988), p. 61. 2. Antony Flew, There Is a God: How the World's Most Notorious Atheist Changed His Mind, 112. Dr. Craig opened the 2012 On Guard Conference in Tulsa, Oklahoma on the subject "What is Apologetics?" The conference was presented by The Reasonable Faith Tulsa chapter and held at The Church at BattleCreek. • How can an all-loving, all-powerful God allow so much suffering? • What about all of the contradictions in the Bible? • Does science disprove Christianity? • Why did Jesus have to die on a cross? • Is Jesus the only way to God? This introductory session on the important role of apologetics will be presented by one of the world’s leading philosophers of religion and arguably the foremost Christian apologist in the world today, Dr. William Lane Craig. When I first laid eyes on this book I was excited to read it. Being a novice in Christian apologetics, I was expecting it to lay a foundation which would help keep my focus and effectiveness as a Christian apologist sound. And it did not disappoint. Chapter One: What is Christian Apologetics? 1. A Basic Definition. The very first sentence of the book defines apologetics. From there, Beilby shifts to Christian apologetics by providing passages where the noun form of apologia appears in the New Testament. These passages reveal that “Christian apologetics involves an action (defending), a focus of the action (the Christian faith itself), a goal (upholding Christianity as true), and a context (the circumstances in which apologetics occurs)” (p. 13). 2. Making a Defense. The two different aspects of apologetics (responsive and proactive) and where we see them carried out in the New Testament are discussed in this section. From the examples in scripture, Beilby provides a succinct picture of the activities that take place in apologetics with the phrase “defending and commending the faith” (p. 14). 3. Defending the Christian Faith. What is meant by the term Christian and what about the term Christian does apologetics defend? These questions are examined in this section resulting in the key idea: “The proper domain of apologetics is the defense of dogmas [defined as core Christian claims], not doctrines [defined as attempts to explain, apply and flesh out dogmas]” (p. 20). Brackets mine. “...to offer sound reasons to believe the Christian faith, reasons that (1) accurately represent the gospel of Jesus Christ, (2) are presented in a Christ-like manner, (3) address our interlocutor’s questions and current spiritual disposition, and (4) help the interlocutor move from a position of basic mistrust (of God, Christianity, etc.) to a position of basic trust-a position that will allow the person to eventually commit his or her life to Jesus Christ” (p. 24). Three limits of apologetics are also determined. First, apologetics cannot and should not provide a revision of the fundamental ideas and concepts of Christianity. Second, apologetics cannot compel belief in Jesus Christ. Finally, apologetics cannot create commitment to Christ. 5. The Apologetic Audience and Context. The potential audiences (person or persons to whom one is speaking to) and contexts (the environments in which one’s apologetic conversations occur) are examined in this section. The definition of Christian apologetics is provided at the end of this examination as “the task of defending and commending the truthfulness of the gospel of Jesus Christ in a Christlike, context-sensitive and audience-specific manner” (p. 31). 6. Apologetics and Related Disciplines. This section ends the chapter with a discussion of Christian apologetics and its relationship with the disciplines (in ascending order of importance) of meta-apologetics, philosophy of religion, evangelism, and theology. A highlight for this reader, is a quote from James Sire found in the notes of the chapter: “The success of any apologetic argument is not whether it wins converts but whether it is faithful to Jesus” (p. 201). In this chapter, Beilby discusses the various ways Christianity was defended and commended during the period starting with the early church through the Reformation and the notable individuals who impacted apologetics during this time frame. In this chapter, Beilby discusses the various ways Christianity was defended and commended during the period starting with the Enlightenment through the twentieth century and the notable individuals who impacted apologetics during this time frame. 2. Postmodernism. “Christians must seek to articulate pictures of truth, rationality and knowledge that acknowledge the postmodern critique of the excesses of modernity. At the same time, they must remain faithful to the Christian concept of God as an objective reality, not merely a social construct, and human knowledge of God and his expectations of humans as possible even if not complete or final” (pp. 84-85). 3. The globalization of Christianity. Beilby advises that with the number of Christians increasing in places like Asia, South and Latin America, and Africa, Christian apologists must learn how to contextualize the defense of the gospel in non-Western settings. This chapter focuses on the different strategies of apologetics: evidentialist; presuppositionalist; experientialist. Beilby examines why different methods exist and what each of them are. He then goes on to evaluate each of them by presenting the objections to their use. In this chapter, Beilby tackles objections to apologetics such as skepticism, postmodernism, and religious relativism. To answer this objection, Beilby writes that Christians must acknowledge past mistakes and seek to distance themselves from them. They must also deal with the “assumption that racial and cultural identities are the sole determinants of religious and moral beliefs. While the ethical and theological beliefs of the West are not true just because they are Western, neither are they false just because they are Western” (p. 130). Finally, the objection assumes a common truth and value across cultures-that oppression and exploitation are wrong. 1. Apologetics is commanded by God. 1 Peter 3:15, 2 Corinthians 10:5, Jude 3, Titus 1:9 are presented as supportive of the discipline. He clarifies that “all Christians are called to do lifestyle apologetics. But only some Christians will be called to the task of developing arguments for the Christian faith and being on the front line of the dialogue between Christianity and the exponents of other belief systems” (p. 151-152). i. Real knowledge comes from the five senses. ii. Faith is “believing what you know ain’t so” (Mark Twain). iii. Belief in God’s existence is for the uneducated and weak-minded. iv. What we call miracles are just unique events that science has yet to explain. v. Believing that your religious beliefs are true and those of others who disagree with you are false is inherently arrogant and intolerant. vi. Jesus Christ was a good moral teacher, but most of what is said about him in the Bible was made up by the church. 3. Theological education requires an appropriate emphasis on apologetics. “Without a conviction of the truthfulness of the Christian message and without some capacity to answer the questions that arise when teaching about the good news of Jesus Christ, theological education quickly loses both its theos and its logos” (p. 154). 4. Meaningful dialogue requires a perspective that is supportive of apologetics. “Meaningful dialogue is only possible between people who acknowledge both the importance of truth and the possibility that one (or both) perspective represented in the conversation might fail to be true” (p. 155). 1. A proper understanding of the nature of Christian belief. 2. A proper understanding of the nature of unbelief. 3. Combining a proper approach to apologetic conversations with effective apologetic arguments. 1. The quality of your arguments matters. “People are not generally persuaded by sloppy reasoning and fallacious arguments” (p. 174). He continues by stating that a good apologetic argument requires significant knowledge of Scripture and theology, passion and conviction, careful study and research, a willingness to test one’s most cherished beliefs, consideration of all available evidence and potential objections, and the proper presentation. 2. Who you are is more important than what you say. “Being a person of character is a necessary part of being an effective apologist, but it is not sufficient by itself. If an apologist is a person of character, then the character itself functions as a kind of an argument for the truth of Christianity” (p. 175) Beilby also writes, “Being comfortable with who you are, being able to control your emotions, and having a natural ability to connect with and relate to people are absolutely essential skills for effective and appropriate apologetics” (p. 176). 3. It’s not about you. Apologetic encounters should not be about impressing the conversation partner or other Christians or about winning the argument. 4. It is about them. An apologist must be audience-focused. This involves the following: understanding the relational dynamics of a conversation; understanding the beliefs of the conversation partner and why they disagree with the Christian faith; speaking in a language the partner understands; understanding how the partner views you; listening more than speaking and understanding more than being understood. 5. Set the correct goal. Moving a conversation partner a step closer to relationship with Jesus through the proper arguments, attitude, and actions. Finally, there is a bibliography of works on Christian apologetics at the end of the book. If you are entering the world of Christian apologetics I recommend this book. With precision and fervor, Beilby: provides a clear definition of apologetics and its history and varieties; defends the importance of apologetics and; ever emphasizes that the task of apologetics is to defend and commend the truthfulness of the gospel of Jesus Christ in a way that honors him and expresses his love to a world that needs to see it and that its goal is to draw those who disbelieve it or doubt it a step closer to a relationship with Jesus. The Ontological Argument is possibly the most misunderstood argument for God's existence. I have always found the argument to be fascinating. The above video is quite possibly the best I have seen on the topic. 1. It is possible that God exists. 2. If it is possible that God exists, then God exists in some possible worlds. 3. If God exists in some possible worlds, then God exists in all possible worlds. 4. If God exists in all Possible Worlds, then God exists in the actual world. 5. If God exists in the actual world, then God exists. Before rolling your eyes and claiming that it's ridiculous or thinking that this argument is to difficult to grasp, I encourage you to watch the video; perhaps more than once! "On September 29th, 2012, William Lane Craig participated in the Contending with Christianity's Critics Conference held at Watermark Community Church in Dallas, TX. Dr. Craig uses the technique of Eastwooding to deal with Richard Dawkins' attempted refutations of the cosmological, moral, teleological, and ontological arguments for God's existence." For more of Dr. Craig's work, see here. "Woe to you, scribes and Pharisees, hypocrites! For you tithe mint and dill and cumin, and have neglected the weighter matters of the law: justice and mercy and faithfulness. These you ought to have done, without neglecting others. You blind guides, straining out a gnat and swallowing a camel! Woe to you, scribes and Pharisees, hypocrites! For you are like whitewashed tombs, which outwardly appear beautiful, but within are full of dead people's bones and all uncleanness. So you also outwardly appear righteous to others, but within you are full of hypocrisy and lawlessness (Matthew 23:25-28; Emphasis mine). For other verses where Jesus deals with hypocrisy, see here. 1. I think it is wrong to be a hypocrite. 3. Therefore, I reject Christianity. 2. Jesus also thinks it's wrong to be a hypocrite. 3. Therefore, I reject Jesus. One should accept or reject Christianity based upon the person and claims of Jesus Christ.